Where was St. Paul’s Lancaster Street Building? The answer of course, was on the south side of Lancaster Street, halfway between Hawk and Swan. But the building (and 98 acres in the heart of Albany), was demolished in 1964 to make room for the South Mall. So let’s reframe the question: where, in what we now call the Empire State Plaza, was St. Paul’s building? Many think it was near where the Center for the Performing Arts (popularly known as “the Egg”) now sits, but we’ve known for some time that it must have been farther west, somewhere between Agency Buildings 3 and 4. Thanks to the New York Public Library, we can now answer the question precisely and definitively. The NYPL web site has images of a detailed 1876 map of Albany showing the church’s location. And they recently added software that allows the user to lay the old map precisely over the current Google map of the same area. The result is below. The darker portions of the image are from the Google map. You can clearly see the edge of the Plaza Concourse in blue near the bottom right corner; the large green rectangle is the park-like area on the Plaza’s northwest corner, between South Swan Street and Agency Building 4 (shown in dark gray). In the bottom left in orange is the South Mall Arterial and immediately above it is Agency Building 3, also in dark gray. 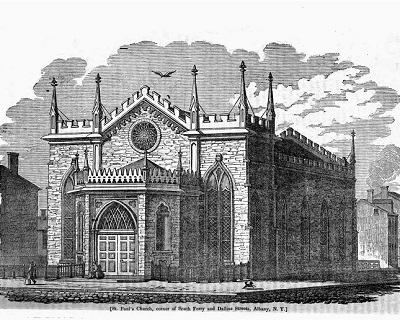 told us quite bluntly that plans for the South Mall in the block bounded by Lancaster, Hawk, Jay, and Swan Streets were such that the continued existence of the Church at its present location was entirely impossible, that the demolition of the Church was inevitable, that we would have only three years in our edifice before it was torn down, and that the possibility of our being able to relocated in the South Mall area was extremely remote. Our present schedule calls for the completion of construction plans and specifications for the Central Air Conditioning Plant and Main Transformer Vault by July 1, 1964. They would then be advertised for bids calling for initiation of work by about mid-August. The site extends from Chestnut Street on the north to Jay Street on the south, and the area to be excavated includes the entire Church property. This work will require the severing of underground utility lines (gas, water, sewer), the relocation of the underground telephone duct system, and the closing of Jay, Lancaster and Chestnut Streets. The extensive excavation (which at the site of the Church will average about 30 fee in depth) and the other construction activities will create such disturbance in the general area that even if it were possible to program the construction so as to delay the need for the Church property as long as possible, I believe the conditions would soon become disheartening to your congregation. The commissioner ended the letter by asking that St. Paul’s vacate the building by the end of August 1964, almost a year earlier than had been promised. The last service in the Lancaster Street building was held July 26, 1964, and the building was demolished in October of that year. This entry was posted in Demolition, Lancaster Street Building, Uncategorized on October 5, 2017 by Paul Nance.